← 30 Days of Otherkin: Kintype(s): What’s it like to be your kintype? I am not really big on prayer. As I wrote about on the last 30 Days of Paganism post, I am not good at having wants, dreams, or needs, and am much more likely to bury them all internally than act on them. So prayer as a form of asking for something from the gods is not really something I often engage in, especially since I run into so many people who treat the gods as vending machines. Besides, for me, a lot of the time the gods are much more willing to give me things, than I am to receive them. They come to my aid whether I am open to it or not, and in the past most of the time I was dragged kicking and screaming. (But their idea of ‘aid’ is often of the tough love kind, so it is do not want on a good day). I am getting better at receiving gifts as a general rule. I have never really had a problem in giving them. If I see something that reminds me of someone, be it a friend, family member, or a god, I have in the past given it to them just because. I also enjoy making things for people. And if I think of doing so or are engaging in an act that reminds me of a god, I will make a small offering. I do not really expect anything in return. The prayers I more engage in, are more of a confessional/cathartic type. Taking my issues and laying them in front of someone else, for cleansing and for comfort. It is healing work, which is currently my biggest focus. This is a give-and-take that I engage in most often with Zagreus. But overall, my relationships with deities are not very formal. Formalities have their time and place, but most interactions could even be seen as irreverent by an outsider. Casual conversations, struggling with/against, fighting with, and being a stubborn PITA are more my MO. They are my family, and I tend to interact with them as such. 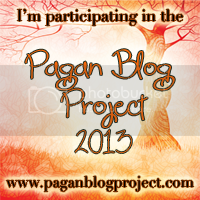 This entry was posted in Uncategorized and tagged 30 Days of Paganism. Bookmark the permalink.